Charlie Manx prowls the secret roads between our world and an evil Christmasland of the mind in his Rolls-Royce Wraith, searching for children to “rescue.” Vic McQueen, psychically damaged by both her own abilities to travel those secret roads (first on her childhood bicycle, then on a restored Triumph motorcycle) and by an earlier encounter with Manx, needs to catch Manx to rescue her son. 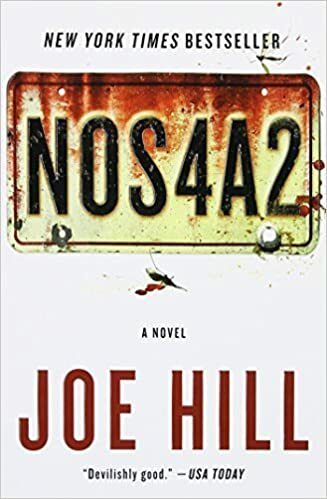 “NOS4A2” moves along at a brisk clip, built as it is around Vic as both pursuer and pursued. It’s a lot like a classic Stephen King novel, jam packed with pop culture references (as well as references , both overt and subtle, to other Joe Hill and Stephen King stories), and full of broadly drawn, over-the-top characters. While it certainly doesn’t break new ground in the horror epic genre–“Talisman,” for instance, was more original in its world-hopping, and some of the spooks in “20th Century Ghosts” are more unsettling than Charlie Manx (though the Gas Mask Man is certainly a high point in chilling characters …)–it’s solidly written and holds the reader’s interest. I especially like that the magic in the book comes at a steep cost for its practitioners–no one can hop between worlds without suffering cumulative damage. The denouement is a little too tidy, but I’m glad that it ends on a happy note after so much pain, especially in the last 150 pages or so.